Raw Ranch Dressing, a recipe. Would you like a little salad with that dressing? Huge green salad with shredded raw beets, sliced cucumbers, raw broccoli florets, a sprinkling of ground sesame seeds & nooch, topped with delicious globs of Raw Ranch Dressing. Ranch dressing isn’t something I really ate much of pregan, but once I’d been living overseas for a few years it was one of the things I found myself craving, oddly enough. The collective unconscious has so strongly identified certain “comfort foods” as a cultural evidence, it just seemed natural to my feeling-homesick-psyche to crave Ranch Dressing. After years of falling victim to the unrelenting advertising industry in the United States, my subconscious had somehow been trained in an eerily Pavlovian way to associate certain food products (the key word being “products”) with certain feelings or moments in my life. From, “You deserve a break today.” to “How do you spell relief.”, my early childhood was punctuated by the advertising leviathan guiding my emotionally-driven consumption habits like a malevolent GPS, and I’d been trained to equate specific feelings such as homesickness with greeting cards, or homecomings with fresh-brewed coffee, happy, smiling family dinners with ranch dressing, etc. Battavia lettuce, cucumbers, dulse and ranch! Like most everyone I’ve been enjoying loads of fresh, raw produce this summer, and I found myself thinking about traditional dips for crudités and such. I knew I had some almonds soaking in my fridge, and so decided to try my hand at creating a little raw ranch goodness, because agribusiness doesn’t have a monopoly on my creativity, baby. Ladies and Gents, it was a delicious success. Be sure to rinse your almonds very, very well. Soaking them for 24 hours is probably enough, but I don’t have a Vita Mix, and find my poky blender does better if they’ve been soaking longer. Add the almonds, water, lemon juice and vinegar and blend really well, next add everything else, stopping to scrape down the sides if your herbs get all crazy. You may also want to start with a little less herbage – I’m crazy about the stuff. Ta-da! You may find this to be a little thick to use as a salad dressing (though perfect for dipping cruditiés). Just add a little water to thin it out. Live-shot from the Shellyfish fridge : on the left, equal parts nooch and sesame seeds, sprinkled on all my salads. On the right, raw ranch goodness. This made a huge amount, but I can’t tell you how much – that little jar is about a quarter of what I had. I am also unable to tell you how long it will keep – I was still eating it a week later, then Monsieur Fish (vegan by default, not by conviction) devoured all that was left dipping Seitan Is My Motor‘s fantastical Zucchini Bread in it (I’ll be blogging about it soon). As I’ve mentioned before, he is not a big fan of raw cuisine, but he just went crazy over this stuff. When I told him it was made with almonds, not tofu, he was shocked. So go make yourself some healthy and delicious ranch dressing kids. It’s the thing to do. Keeping things short and sweet my friends : this Raw Coconut Cream Pie rules. It’s obviously something special because I never post twice in the same day! But since today is #rawwednesday on twitter, I thought I share this for any of my tweet-pals who wanted to give it a go. There’s no soaking required, and it takes all of 5 or maybe 7 minutes! I feel like some kind of raw foodist super-hero chica extraordinaire (which I am *so* not!) because it’s really that good. I obviously can’t take credit for fruits and nuts being so delicious, but I can be thankful I took a risk and tried to create something I was craving! So easy, so quick, you’ve no excuses not to make one yourself! Toss everything into the food processor (no, you don’t need to wash or rinse it, save the water, kids! ), adding a little water if you need to. If you feel it needs a little more walnut goodness than add in another 1/2 cup. Pat pie crust into a 17cm/7in custard dish (or even on a plate, whatever’s clever!) and top with chilled Coconut Cream Filling. It’ll taste better if you let the whole thing chill for a little while, but it’s ok if you can’t wait – I couldn’t. This week’s recipe is a favourite of mine : Cocoa Nibbles! These raw bars rival any over-priced, mass-produced bars you can find in your local supermarket or health food store and are quick and easy to make. I admit to using carob powder in lieu of cocoa powder, just because. The recipe provides some great add-in ideas, keeping this recipe fresh and different depending on your mood (and what you have on hand). This time around I added cinnamon and ground Vanilla Rooibos Tea. Rooibos or Red Tea is just full of anti-oxidants, and I love the vanilla flavour it adds. I often add a teaspoon of rooibos to my smoothies or raw bars…that’s just the kind of girl I am. I’m not the best bar-shaper, mostly because I don’t really care about their visual aesthetic. I just want them to be delicious. After I roll them out into a log-shape and chill, I cut them up, and set them on a piece of foil. You can use the foil to push them into a square or bar shape, and your fingers stay clean! You don’t have to individually wrap these, but I like to have them as on-the-go snacks. Don’t they look so “Lost In Space”esque? Ready for the best part? You can make these, even if you don’t have Sweet Freedom yet! Visit Diet, Dessert and Dogs for the Cocoa Nibbles recipe! Have you made anything yummy from Sweet Freedom this week ? Stay tuned next Saturday for another installment of “Sweet Freedom Saturdays”. We’ve also got a brand new Sweet Freedom Flickr Group – come join us! Other Sweet Freedom Saturday deliciousness here in the Fishbowl : Mrs. K’s Date Cake, Raw Apricot Bars, Tomato Spice Cake, Carrot Snack Cake, Banana Chocolate Chip Muffins, Gingered Apple Muffins, Spiced Pumpkin Millet Pudding. Thank you for the wonderful response! Congratulations to our winners, found here. Happy Saturday everyone! I just love Saturday, and what can make your Saturday even sweeter? How about some Raw Apricot Bars? 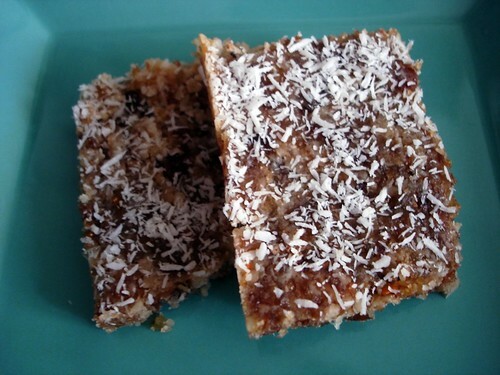 These delicious raw bars will satisfy your sweet tooth in an oh-so-healthy and delicious way. They are a real snap to prepare which I just love, and you can even frost them if you want to with the Coconut Date Frosting recipe – also raw of course! I opted to just give them a light sprinkling of shredded coconut this time around. I wish I could say they were a big hit with Guppy, but, alas, they were not. She is such a funny bunny; she just loves raw and dried fruits, but she just can’t get her raw treats groove on. Monsieur Fish is the same way – salé raw cuisine is no problémo, but when it’s sucré, he just wrinkles his nose. Whateveah. That means more raw goodness for me! These would be an excellent mid-morning or mid-afternoon sweet snacky treat – portable and easy to stash in your gym bag or purse. Who needs to purchase over-priced raw bars? These are even tastier! Now, didn’t I say something about a giveaway? It’s nearly July, and that means three of my favourite freedom-related holidays : July 1st is Canada Day, July 4th is Independence Day, and July 14th is Bastille Day here in France. Wee! While I could debate the idea of freedom, and it’s obvious subjectivity – I won’t. At least not today. Today I’m here to share Sweet Freedom with you! Author Ricki Heller, who blogs at Diet, Dessert and Dogs, has graciously donated two copies of Sweet Freedom, a hard-copy and a PDF, for me to give to YOU! We’re entering into the “heat” of BBQ season, and you’ll be the hero of the picnic when you arrive with treats that everyone can enjoy! You can Tweet about the giveaway, linking back to this post. This will score you an additional 3 entries. (Visit Tiny URL if you need to condense.) Just don’t forget to comment with a link to your Tweet so it can be counted! Blog about the giveaway, linking back here. 3 more entries are yours! Just don’t forget to comment with a link to your blogpost so it can be counted! The drawing will be closed next Saturday, and the winners will be announced on Wednesday, July 1st, to celebrate Canada Day in style! Bonne chance à tous! Have you made anything yummy from Sweet Freedom this week ? Stay tuned next Saturday for another installment of “Sweet Freedom Saturdays”. We’ve also got a brand new Sweet Freedom Flickr Group – come join us! Other Sweet Freedom Saturday Deliciousness here in the Fishbowl : Tomato Spice Cake, Carrot Snack Cake, Banana Chocolate Chip Muffins, Gingered Apple Muffins, Spiced Pumpkin Millet Pudding. Raw Yummies : Something that reminds me of Tuna Salad (in a good way). Spring has indeed sprung here in France, and though I feel like I’m ready to sprout myself for the liters and liters of rain we’re getting, I’ve been in the mood for something fresh and bright. No tuna were harmed in the making of this salad. I saw this recipe that Pixiepine posted, and decided to give it a whirl. I’m so glad I did, because it was delicious! I’m not going to re-post her recipe – just go check it out! My favourite “Salad of the Sea” mix. It’s got dulse, nori and sea lettuce (not sure what it’s real name is in English – that’s just what we call it here), and it’s great. Not too fishy as to scare away Monsieur Picky Pants (aka Monsieur Fish), but just enough to lend a nice sea-worthy flavour reminiscent of the tuna salad I loved as a kid. I really recommend this – it’s not going to fool anyone (unless they’ve had too many martinis), but it’s a delicious alternative to eating fish. We had this on a simple green salad, then the left-overs worked well as sammie filling with sliced tomato and greens. Delish! I don’t want to offend any hard-core Larabar lovers out there. I really like them, and brought a bunch back from the US with me (though my stash was quickly depleted), but let’s face it kids – they are muy expensive, and you can make some similar tasting yummies at home. 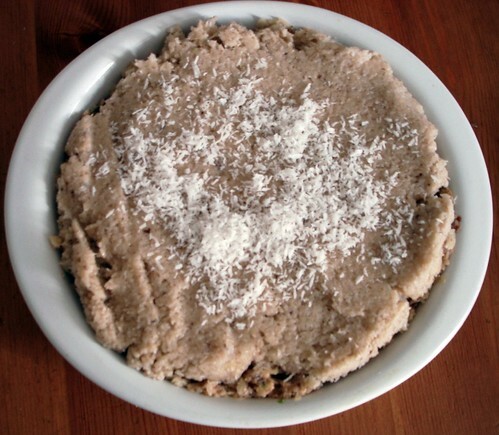 Back in October during Vegan MoFo I posted this recipe for Raw Banana Bread Bars. They are yummy bars, but I was playing with the recipe, trying to come up with something new and a little more daring for breakfast. I really like the way these turned out, the ginger gives them just the right amount of sassyness, and coconut and carob are always happy together! In your food processor grind up the almonds first, then add the rest of the ingredients. You may need to add more or less water, depending on how dry your bananas are, and if you have carob issues you could swap it for cocoa powder of course. Once things are ground up to your liking and sticking together, they’ll need to set just a bit. I put mine in this cute little silicon flower mold – and I got 6. You could also just line a tupperware-type container with plastic wrap or parchment paper and press it flat with your fingers. I put mine in the fridge for the afternoon, then took them out and wrapped them individually for easier portability. I keep them in the fridge, and while I’m not a food Scientist, I’ve kept them for 2 weeks and they were still a-ok.
I’m hoping to try a walnut variation on these, so I’ll let you know how that works out. Hope you’re having a lovely Saturday out there, kids! Raw Flourless Chocolate Cake & Homemade Piña Colada Sorbet – Daring Bakers Challenge Time! 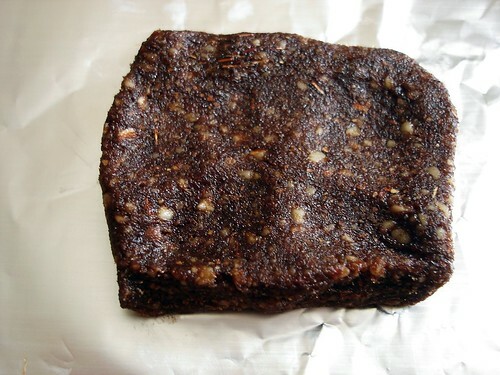 The instant I saw “Flourless Chocolate Cake” on this month’s challenge post, I knew I wanted to make this challenge Raw – as in raw cuisine. There have been other challenges where I could have really stretched things to allow for a raw interpretation, un peu tiré par les cheveux, as we would say in French, but this challenge just lent itself naturally to a vegan/raw possibility. I also knew right away which recipe I’d be using : the Flourless Chocolate Cake recipe from Jennifer Cornbleet’s Raw Food Made Easy. If you’ve ever been curious about raw cuisine, but haven’t been sure where to start, I strongly recommend this book. Unlike many popular raw foods chefs, Cornbleet offers a comprehensive collection of recipes requiring only the most basic kitchen equipment, and she forgoes the seemingly requisite list of exotic ingredients so many other raw foods chefs refer to as kitchen staples. This is a great recipe and I’ve blogged about it before, but I haven’t made it for a while. In fact, I’ve all but stopped concentrating on raw cuisine since my accident back in November. Please don’t misunderstand, I’m still eating crudités, raw fruit, salads, etc., but my weekly Raw Thursdays (and Tuesdays) stopped when I broke my foot. Partially because Monsieur Fish was doing most of the food prep and raw doesn’t interest him, and also because food prices have made buying nuts and dried fruits nearly impossible for us. I’m hoping to prepare more raw meals in the near future, and I thought February’s challenge would be a wonderful opportunity to showcase a raw dessert, especially for those of you who maybe haven’t tried one yet. This is the first time I used cocoa powder rather than carob for this cake, and I used a generous half a cup rather than a third. It came out very fudgy and tasting like a tourte or as my husband said “cake batter, but in a good way”. A friend of mine has a small farm in a near-by village, and she recently gifted me two big bags of organic walnuts. What a treat – perfect for this recipe! We were also supposed to make an ice cream component, and I opted to take a spin on Mark Bittman’s sorbet formula. I’ve used this basic recipe to make sorbets before – it’s really easy, fast and delicious. I wanted to try to keep it “white”ish because we were supposed to make vanilla ice cream, so I decided to honor the spirit of the challenge by maintaining the colour, though I did take a few liberties with the flavour. This could easily be made 100% raw by omitting the vanilla or by using some scraped vanilla beans. Humm, vanilla. I put the pineapple chunks in one layer and put them in the deep freezer. I also put the coconut milk in the deep freezer – I poured it into a shallow plastic container – it was easy to break up and scoop out. Once everything is well frozen, at least 8 hours, just pop it in your food processor. I processed the pineapple chunks first, then added the coconut milk and vanilla. When it’s nice and blended, you can either quickly eat (it’s very melty), or put it back in the deep freezer for a few hours, then re-process just before serving. I like this method because it’s nice and scoop-able. The paring of this flourless cake and the piña colada sorbet was just heavenly! When I was a kid, I would always try to let the ice cream melt a little and mix it up with my cake. I was that kind of kid. That’s exactly what this reminded me of – so delicious! I’d like to thank Wendy of A Charmed Life and Dharm of Dad – Baker & Chef for hosting our challenge. Do be sure to check out all the other Daring Bakers creations! Here’s the fine print : The February 2009 challenge is hosted by Wendy of WMPE’s blog and Dharm of Dad ~ Baker & Chef. We have chosen a Chocolate Valentino cake by Chef Wan; a Vanilla Ice Cream recipe from Dharm and a Vanilla Ice Cream recipe from Wendy as the challenge.